* 60% less fat than USDA data for pork & beef sausage. Fat content has been reduced from 19g to 7g per 55g cooked serving. Once you try Premio Italian Chicken Sausage with Pesto, you’ll have no doubt that the pair was a match made in heaven. Our Premio Italian Chicken Sausage with Pesto should be on everyone’s list of favorite couplings. This sausage has a captivating flavor that’s sure to please even the most discerning dinner guest. Not sure what to serve tonight? Try some Premio Italian Chicken Sausage with Pesto over pasta. Ingredients: Chicken, Less than 2% of the following: Salt, Sugar, Vinegar, Parmesan Cheese Powder [parmesan cheese (part skim milk, cheese cultures, salt, enzymes), whey, buttermilk solids, sodium phosphate, salt], Lemon Juice Concentrate, Olive Oil Flavor (maltodextrin, natural flavor, rice starch, tocopherol, citric acid), Spices (including black pepper, basil & anise), Paprika, Dehydrated Parsley, Dehydrated Garlic, Natural Flavors. Stuffed in Hog Casings. Always cook sausage links to a minimum of 165° F.
Whoever invented pesto was clearly a foodie genius. Mixing together the distinct flavors of basil, cheese and olive oil delivers a taste bud experience unlike any other. Your mouth puckers with the pungency of the basil, while tingling from the richness of the cheese. Any meal made with pesto automatically becomes a better meal. And when you combine that unique flavor with sausage, which is sumptuous on its own, you get a special food that will quickly become one of your go-to dinner or lunch staples. Our sweet Italian chicken sausage links with pesto aren’t just tasty, though. They’re also healthy. Made with chicken sausage that has 60% less fat than USDA data for pork & beef sausage, our meat will fill you up but won’t weigh you down. It’s free of trans fats and MSG. We never use fillers in our sausage, either, so you know you’re getting real, fresh ingredients when you pop a link from Premio Foods on the grill. Fueling yourself with the right food will help you get through your busy day. Our chicken sausage brims with protein, but it’s low in calories. When you’re looking for a meal that’s quick to make or easy to take with you on the run, consider our chicken sausage links. They’ll keep you full for hours without the heavy feeling you get from unhealthy foods. As a family-owned business, Premio Foods has always put a premium on connecting with our customers. We know you share our own concerns about feeding your family the highest-quality foods that are also easy to make and taste great. Cooking for your near and dear ones lets you show how much you love them. 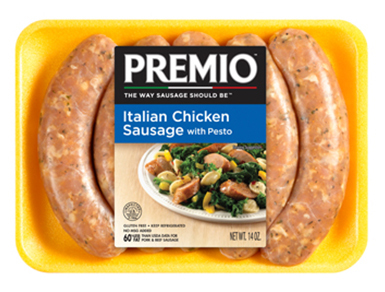 When you use Premio Foods products, you give them sausage you can feel good about loving. We care not just about our own family, but also about the families of all of our customers. That’s why we’ve implemented sustainability practices to keep our carbon footprint low and help look out for the environment. Are you ready to experience the flavor combination of pesto and sausage? You can order directly from our website or you can check out our store locator to find a store near you to purchase our sausage. When you buy a great-tasting product that’s also good for you, it’s a win-win. Try Premio Foods sausage today! The full-bodied flavor of the succulent and juicy Premio Fresh Italian Chicken Sausage with Pesto will make your meal times an absolute delight. Our Fresh Italian Chicken Sausage with pesto will take your recipes to the next level with its enchanting flavor. It makes amazing spaghetti with zucchini and the “Premio Fresh Sweet Italian Sausage Pesto Pasta” is a must-try! For an even healthier and heartier meal try a delicious Premio Pesto Chicken Sausage Lentil.